A professional garden designer and avid gardener, Nancy came up with a solution. 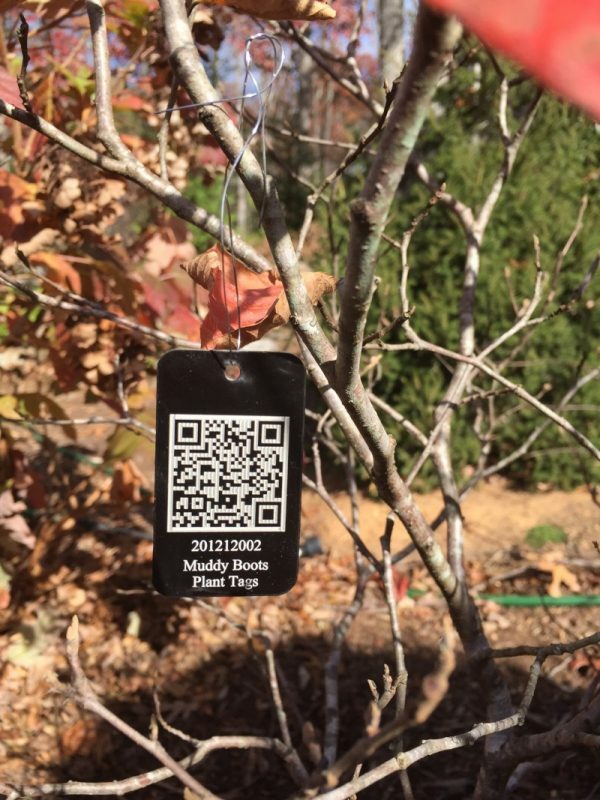 Muddy Boots Plant Tags are durable plant tags that can be scanned by a smart phone, retrieving information about the plant that the gardener has input into the Muddy Boots Garden Record-Keeping Application. “Instead of crawling around to find the tag and reading the tag, often at ground level, you scan the tag and read information about your plant on your phone,” said Nancy. Bullington Gardens, a 12-acre horticultural education center and public garden in Henderson County NC, has recently selected Muddy Boots Plant Tags. “We are excited to implement Muddy Boots Plant Tags. The Record-Keeping Application will allow us to better organize information about our remarkable plant collection and the plant tags will make that information accessible to our many visitors,” said John Murphy, Director of Bullington Gardens. Muddy Boots Plant Tags are made of aluminum and feature a unique QR code that links it to the plant data in the Garden Record-Keeping Application. The tags are durable and made to hold up for years in the elements. These plant tags are available in bundles of five at the website. A purchase of plant tags is not required when using the Garden Record-Keeping Application; however, the plant tags are necessary for scanning plants while out in the garden. The Muddy Boots Garden Record-Keeping Application is free for gardeners with up to 25 plants and 50 photos. Gardeners with more plants and photos may purchase a subscription for $4.95 per month, or $49.95 per year allowing up to 500 plant records and 5,000 photos. There are higher level plans for larger gardens described at the website. All levels include unlimited plant and garden journal notes and are “Ad Free” – no ads whatsoever appear in the Garden Record-Keeping Application.